Researchers from Yakutsk went to the Alaskan capital Juneau to study the archive belonging to the Russian bibliographer Mikhail Vinokurov who emigrated to the USA in 1917 after the Bolshevik revolution. They discovered a certificate issued by Russian government commissioner Captain Second Rank Aleksey Peshchurov, detailing the transfer of Russian territories in Alaska to the United States. According to this document, Spruce Island has been granted to the Russian Orthodox Church ‘for eternity’. Spruce Island was known as the New Valaam after Valaam Island in North Russia that is home to one of the oldest and most respected Orthodox monasteries. In early XIX century it was also the home of St Herman of Alaska- a Russian Orthodox saint and a missionary to the “Russian America” – the territories in Alaska and California colonized by Russians. “2014 we will mark the 220th anniversary of the Russian Orthodox Church mission to North America and this is a perfect time to pay attention to the Russian America. I stand for the restoration of historical justice – the return of Spruce Island to its lawful owner – the Russian Orthodox Church,” Mayor Aysen Nikolayev told the Izvestia daily. A senior church official in charge of relations with the society, Archpriest Vsevolod Chaplin only gave a reserved comment, saying that the discovered papers must be thoroughly studied in order to assess the perspective of the claims in the modern environment. In 1867 the Russian Empire sold Alaska and the surrounding islands to the United States for $7.2 million in gold that the Tsar needed for financing the reforms caused by the abolition of serfdom. 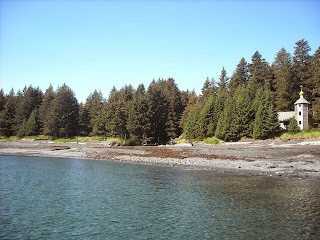 The 46-square-kilometer Spruce Island is a part of the Kodiak Archipelago, South of Alaska. Currently about 250 people live on the island.